Description: Cool syncopation, funky riffs and smooth, stylish tunes – from dynamic to nostalgic, Pam Wedgwood's series has it all. 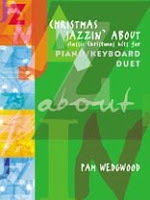 Christmas Jazzin' About is a vibrant collection of original pieces in a range of contemporary styles. So celebrate the festive season in style with these jazzy arrangements of popular Christmas carols.